The Clarity vision has been designed to give the widets width and view of the fire wilst keeping the nominal rated output of 5kW. It is one of the widest 5kW stoves available in the UK. 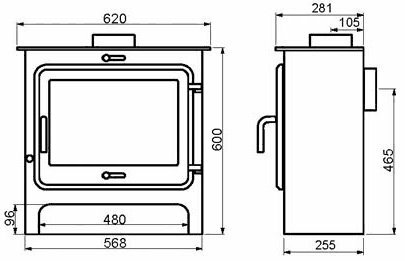 It is based upon the dimensions and size of its big brother the Clarity 12, the depth has been reduced to allow for easier insertion into shallow fireplaces or less intrusion into the room when used in a freestanding situation outside of a fireplace and against a wall. As with all Ekol stoves, the Clarity is approved by DEFRA for burning wood inside of a smoke control zone, and with an 82% efficiency rating it is in the top percentile for efficiency among all wood burning and multifuel stoves.